Gardner Denver's Robox Aqua blower has been developed to meet the demands of the aquaculture market. Gardner Denver will be exhibiting its Robox Aqua blower, specifically developed to meet the demands of the aquaculture market, at the AgraME show which takes place 5-7 March in Dubai. Designed for offshore and onshore feeding systems, the Robox Aqua uses rotary lobe blower technology in applications such as fish food distribution into open water, delivered as part of a pneumatic conveying system from barges, as well as for increasing water oxygen content in aeration processes which helps encourage greater fish yields. 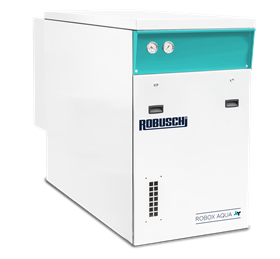 Capable of delivering pressure up to 1,000 mbar(g), volume flow of up to 700m3/h and motor power up to 30 kW (IE3 motor efficiency class), the Robox Aqua uses direct coupling to avoid transmission losses. The Robox Aqua takes up to 33% less floor space than a conventional blower package and its modular design means it can even be stacked on top of scaffold structures for barges with only very limited space available. AgraME takes place at the Dubai World Trade Centre in the UAE. The Gardner Denver team will be In hall Z4, stand C10, with its Robox Aqua blower.